Try them all with a variety pack! 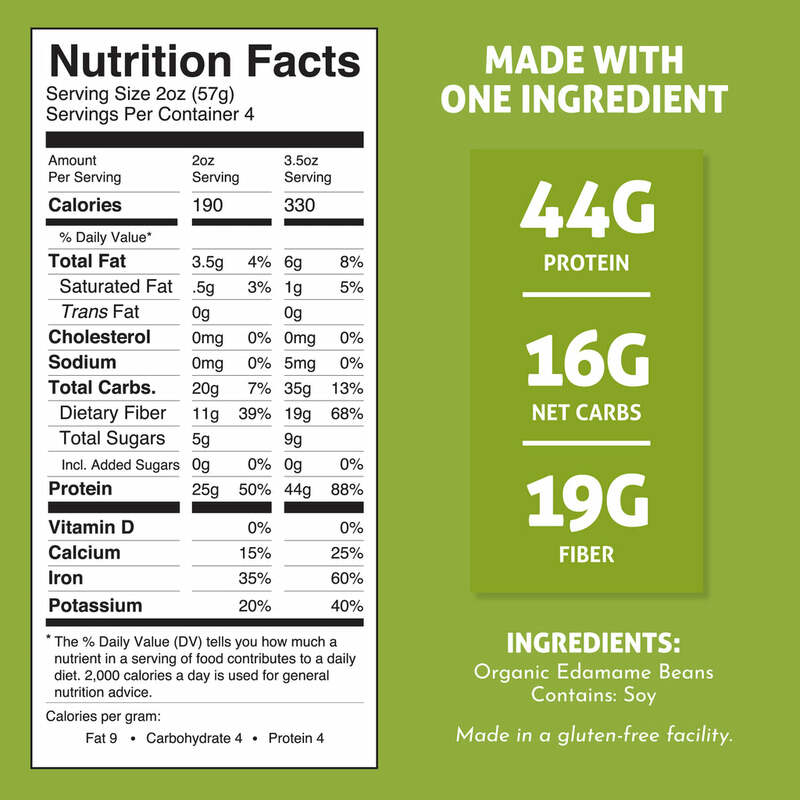 Delicious and totally nutritious noodles made with one sole ingredient… beans! Each serving fuels your body with 3x the protein, 6x times the fiber and less than 1/2 the carbs of your average noodle. Cooks in 3-5 minutes! 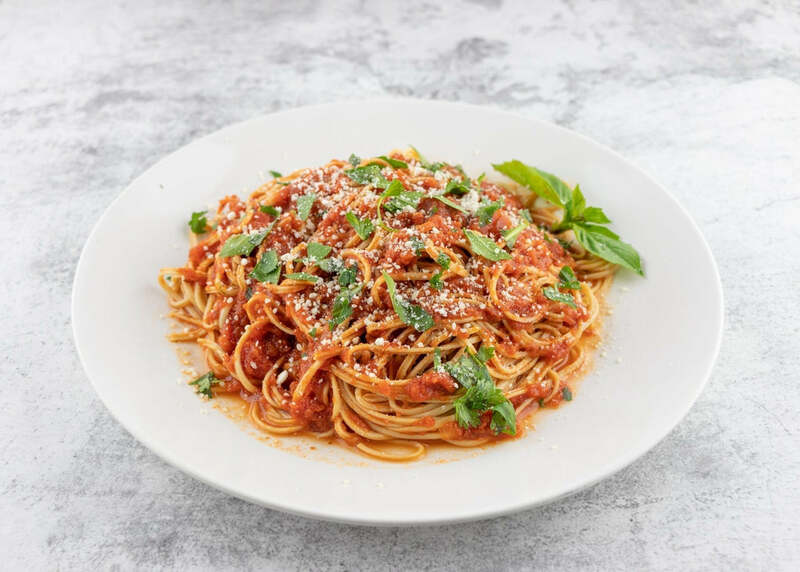 Simply bring 6 cups of water to boil in a large pot, add The Only Bean noodles, turn heat to low and cook for 3-5 minutes, strain, rinse and enjoy with your favorite sauce! A delicious meal that leaves you feeling good instead of guilty! Beans are packed with complete protein. They contain all nine essential amino acids that our bodies cannot synthesize itself, making it one of the best sources of protein. Beans are also high in antioxidants, fiber, B vitamins, iron, magnesium, potassium, copper, and zinc. Our beans are naturally and organically grown in nutrient-rich soil. Our noodles are made 100% with beans and only beans! No other ingredients besides water are added. Oil extracted from the beans are sold to third-party companies and food scraps are used for animal feed. We are The Only Bean. Here to unlock the incredible potential of beans and share the goodness with the world! Beans have been the underdog for too long and its time for someone to show the world what they’re capable of. The Only Bean is committed to using sustainably grown, organic and non-GMO beans as our core ingredients to create innovative food products that are healthy and delicious. Our philosophy at The Only Bean is that if you eat good and do good, you’ll feel good. If you’re watching carbs and/or looking for more protein in your diet, you HAVE to try these. They have so much protein and fiber and only 9g of net carbs. The texture is al dente and stays that way. I tested it out with meal prep last week and the texture held up all week. I wasn’t sure which one to get so I got the variety pack but liked the Edamame the most. I would suggest trying a variety pack if you can’t decide. Great taste, and cooks in 4mins or under. What is not to love about these? Love the edamame and the soy bean pasta. I like the black bean pasta, however, I need to find something other than marinara sauce. I think it would be better with a red pepper sauce. Anyway… i order these because my husband and I started a plant based diet. I needed to find a way to eat more beans. What I love the most is that I feel like I am cheating with Pasta when I eat them. Its a plus they cook so quickly! When I saw this product show up on my search for vegetarian, gluten-free pasta, I was excited, to say the least. Looking at the ingredients, I was pleasantly surprised to see that each of their pasta has only one ingredient. Being very health conscious, the thing that I was initially most concerned about about was the fact that these noodles are created overseas. After messaging the seller and doing my own research, it seems that China actually has very strict regulations in place that restrict GMO soybeans from even being planted. On the other side of that, I learned that 82% of soybeans produced globally are GMO. It turns out that these could be healthier than US-based alternatives! Overall, I’m very happy that I tried this brand’s pasta, and looking forward to trying all of their other varieties! Very good pasta! I use it for stir-fry and many other asian dishes. I own a restaurant and just added this to our menu. It is a great gluten-free and vegan alternative for all of our noodle dishes. Addicted!!! Pasta doesn’t have to be a cheat meal ANYMORE!! These noodles are delicious and I love that they are high in protein and come in different flavors/noodle types. The best part is that the noodles contain only one ingredient! They’re definitely not the same as wheat spaghetti but the noodles really well with pesto, thicker sauces like an Alfredo, and also Thai curry sauces. I’m sure they’d be good in a pasta salad too! Definitely recommend trying these if you’re curious! As someone who loves pasta, I was fairly skeptical, but it really is a GREAT alternative to traditional pasta. After I tried it, I made some up for my Mother-in-Law who is Gluten-Free, and she said it was the best Pasta Alternative that she has had yet! Gotta try them all! A friend of mine suggested these and I couldn’t decide which one to get so I got the variety pack. My favorite are the Edamame pasta but they were all good. I cooked these just like normal pasta but much quicker (4-5 mins). It’s one of the easiest pastas to work with since they don’t get mushy or clump together. I even had some left overs that I reheated and the texture held up. Very impressed! Great source of protein if your looking for alternatives. Taste is pretty good too. Great low carb results for b/g. what about rigatoni, fussili ,bowtie and penne in future? FREE SHIPPING - NO MINIMUM ORDER REQUIRED!